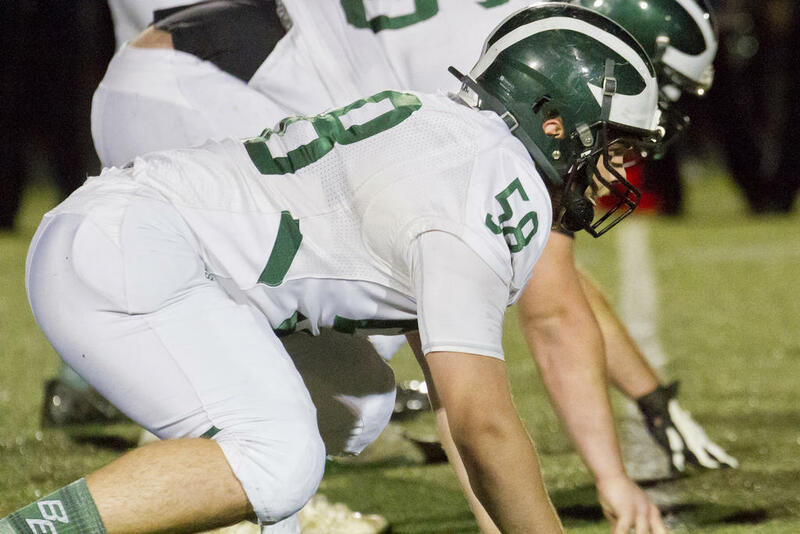 STANDISH–Bonny Eagle senior Aidan McGlone is a finalist for this year’s Gaziano Offensive Lineman Award. McGlone, ranked third in his class, has earned himself high academic honors since his freshman year, according to a press release. He’s also member of the National Honor Society. As a senior, McGlone garnered SMAA All-Conference and All-Academic laurels, and was named to the WCSH6 Varsity Club. He’s also on the Bonny Eagle lacrosse and unified basketball teams. He mentors multiple fellow Scots, helping them fit in socially with their peers. McGlone is an involved member of the larger community, helping with the Special Olympics of Maine, as a youth coach, at the Buxton Food Pantry and with the Savage Family Turkey Trot. McGlone’s fellow nominees for the Offensive Lineman Award are Chase Lamontagne (Kennebunk) and Zach Reed (Scarborough). This year’s nominees for the Defensive Lineman Award are Cole Melanson (Leavitt), Nick Mills (Cony) and Tom Palmer (TA). Aidan McGlone lines up in a late-season game at Scarborough.